I was seven years old when I first came under the spell of weather, both on television and outside. It was a muggy spring night in Oklahoma, and severe thunderstorms were approaching, as they so often do that time of year. As I sat watching one of the particularly mindless situation comedies peculiar to the 1960s, the show was interrupted by a serious young woman talking about tornadoes. How does she know what the weather’s doing? I wondered. The way Lola Hall described terrifying storms with such calmness and authority carried a touch of magic for me. From that night onward, I was hooked on meteorology, and the way television and weather interacted. Many a weather enthusiast first became fascinated with the weather by watching their local television meteorologist on the nightly news. Through the years, the TV weather report has a created a rich history that uniquely reflects the evolution of both science and show business. 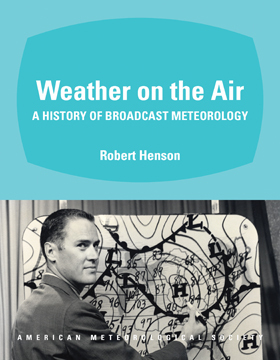 Now, just in time for the 38th Conference on Broadcast Meteorology, AMS Books has released Weather on the Air: A History of Broadcast Meteorology, by UCAR’s Robert Henson. It’s the most comprehensive book on the subject in print. Henson’s narrative starts at the earliest days of TV, with the predictions of Muncie, Indiana’s Jim Fidler and–soon thereafter–the animated character Wooly Lamb on WNBT in New York City. The story continues through the comedians, “weather girls,” and other entertainers who often presented the weather reports in the ’50s and ’60s, to the eye-catching graphics, technological advancements, and the rise of 24/7 TV weather in more recent times. On the way, Henson explores key developments in the history of broadcast meteorology, including the effort to professionalize weathercasting, the advancement of women and people of color in the field, the complex interrelationships between government and private forecasters, the evolution of severe weather warnings, and the effects of climate change science and the Internet on current broadcasts. You can find more information and order the book here.